Combine popular math tools like OneNote and GeoGebra to create astonishing, interactive math textbooks. Let’s find out how below. Microsoft OneNote makes digital textbook creation easy. Students can work together on a single OneNote notebook that is organized into “notebook, section groups, sections, and pages.” Create a OneNote notebook as a textbook template, then share it via Docs.com. Students can grab the OneNote notebook digital textbook template, then enhance it. Each student or group of students can take responsibility for a specific section. OneNote enables you to insert all sorts of content, such as Vimeo, YouTube, Office Mix, Sway, and Microsoft Forms. Table of Contents. You can use Onetastic add-on to OneNote to auto-generate a table of contents for each “section chapter” and the digital textbook as a whole. Organize the OneNote notebook into sections. Each section is a chapter. Each section chapter will include its own table of contents and introduction. Students create hand-drawn resources and then digitize their creations with the mobile-friendly Office Lens app. Tablet access? Students can create their first draft of figures within OneNote. Identify key terms, record video/audio definitions and explanation. Design tall buildings and describe in a video how they were created. For math problems, students can use OneNote digital whiteboard technology to draft their explanation. Or rely on Microsoft Snip’s whiteboard capabilities and then embed that in the OneNote page. A few other tips include adding tags to chapters, creating a hyperlinked table of contents for each section, and setting a page template specific to each section. When complete, future classes can access the digital textbook via OneNote Online or a “frozen” copy can be permanently published at Docs.com. Wondering how to add difficult mathematics constructs? Take advantage of GeoGebra tools and materials. GeoGebra is dynamic mathematics software for all levels of education (free to non-commercial users) that joins geometry, algebra, spreadsheets, graphing, statistics, and calculus. It also runs offline and works on various software platforms and devices (Source). 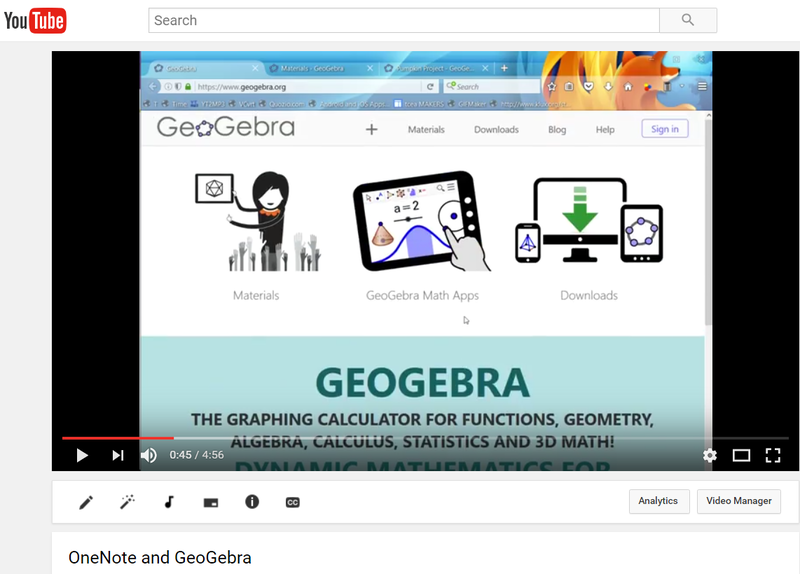 GeoGebra enjoys a rich community of support (check out Kurt Soeser, fellow Microsoft Innovative Educator (MIE), work | watch his video) with over 500,000 pre-created resources. In addition to creating content with GeoGebra, students can also place any of those half a million resources within their digital textbook. Want to see this in action? Go to my TCEA Connect OneNote notebook using this link. You can also watch the YouTube video walkthrough. Rather than rely on traditional textbook publishers, adopt a maker attitude in your math classroom. Empower students to create digital textbooks using Microsoft OneNote and GeoGebra. Publish to a worldwide audience and ensure that the learning is meaningful and authentic. 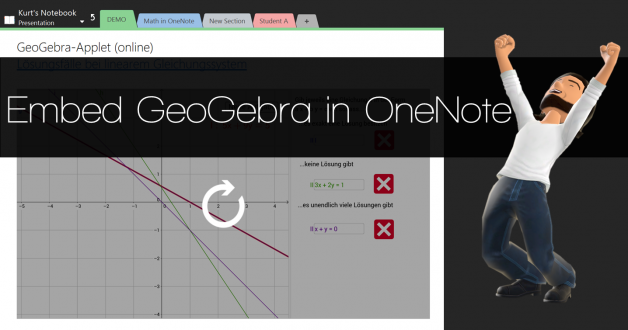 “Embed GeoGebra in OneNote” via Kurt Soeser as featured in the LearnOneNote Conference. Available at https://www.learnonconference.com/kurt-soeser-2016 during 11/12-11/17, 2016.